Married at First Sight spoilers show Jona Bienko is ready to ask Brandin Brosh to marry him on Honeymoon Island. Things started out rocky for the couple. Will they turn the corner and begin their lives together as a happily married couple once their time on Honeymoon Island ends? Married at First Sight spoilers indicate that the parents arrive in St. Lucia this week to meet their potential in-laws. Thus far each couple has had alone time to get to know one another. Throwing potential in-laws into the mix is a completely different story. Will these potential spouses make a good first impression on Married at First Sight: Honeymoon Island? Married at First Sight: Honeymoon Island spoilers indicate that things don’t go smoothly for all the couples. Eric Acosta admits to Katie Muller’s parents that he works with medicinal cannabis. The topic of children comes up when Kimber Gardner sits down to dinner with Shannon Raddler’s family. Kimber not wanting kids has been the one sticking point for this couple. There’s added pressure with family around. Chris Perry introduces his daughter to Jada Rashawn. This is a big step for Chris. Jada is the first girl he’s introduced to his daughter. He was initially attracted to Jocelyn Thompson at the beginning of the Married at First Sight: Honeymoon Island journey. Chris and Jada are closer now. They’ve nurtured a genuine bond in a short time. It will be interesting to see if that bond holds once Chris is back out on the road. Jona Bienko ready to tie the knot with Brandin Brosh? Jona Bienko has been serious about Brandin Brosh from the start. He second-guessed himself once or twice. Beyond that, he knows what he’s looking for. Married at First Sight: Honeymoon Island spoilers indicate he asks her to marry him. He’s on the phone with Brandin’s mother, Susan. He lets her know that he’s going to ask for Brandin’s hand in marriage. It will be interesting to see if he actually goes through with it on this week’s episode of Married at First Sight: Honeymoon Island. The general consensus among fans on social media is that Jona is a sweet guy. Many don’t think that Brandin is as into him as he’s into her. In that regard, a lot of viewers don’t want to see another nice guy get his heart broken. When Jona tells Brandin’s mom that he’s going to ask her to marry him, she doesn’t seem enthused. The Married at First Sight: Honeymoon Island journey is coming to an end. The show was filmed over the course of three weeks at St. James’s Club Morgan Bay in St. Lucia. With two episodes left, things are getting down to the wire. The remaining couples will have to decide whether they’re ready to propose to their partners or whether they’ll leave Honeymoon Island empty-handed. Do any of the couples have a real shot at a successful marriage? Catch an all-new episode of Married at First Sight: Honeymoon Island Tuesday at 9 PM only on Lifetime. 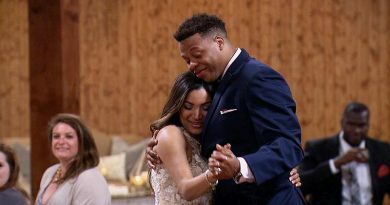 ← 90 Day Fiance: Leida Forces Broke Eric To Make A Buck – ‘Happily Ever After’ Money Makeover?